In the 1960s and 1970s, when ruled by a succession of military regimes, Bolivia developed a bad record for human rights violations, as well as repression of key labour sectors (such as the mineworkers). Some of the worst human right violations took place in 1980-82 during a succession of particularly vicious military governments. Since then, one of the most conflictual areas has been in the Chapare region of Cochabamba, source of much of the coca used in the manufacture of cocaine. Bolivia is the world's third largest producer of coca leaf, a crop which has many harmless traditional uses but is also an ingredient for the manufacture of cocaine. Bolivia has been one of the largest recipients of US anti-narcotics aid, provided both in money and in kind (training and advice by US DEA agents based in Bolivia). During the 1990s, particularly during the Banzer government (1997-2001), Human Rights Watch reported allegations of serious human rights abuses by Bolivian security agents and US military personnel in areas targeted for forcible coca eradication. Since his election in 2006 President Morales, formerly leader of a coca growers' union, has increased the area of permitted coca cultivation while calling on families to exercise 'restraint' and 'responsibility' in permitted production for traditional uses. In 2003, 67 civilian protesters were killed in El Alto, a low-income township adjoining La Paz, when army personnel opened fire on demonstrations over the government's gas policy. An official investigation was criticised for failing to ensure military co-operation; and in May 2004 the Constitutional Court awarded jurisdiction over the affair to civilian, rather than military, courts. In 2005, Amnesty International expressed concern over the human rights consequences of widespread political unrest. A sharpening of political crisis and confrontation saw social mobilisation, strikes and blockades resulting in the overturning of the presidency of Carlos Mesa in June and the eventual election of Evo Morales in December 2005. Amnesty expressed the view that the crisis 'ha[d] its roots in the violation of the economic, social and cultural rights of marginalized groups'. 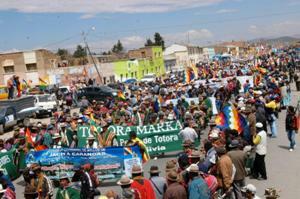 * Many of the incidents had to do with land disputes and occupations by landless groups, and Amnesty concluded that the economic rights of Bolivia's indigenous communities were not being upheld. Prison overcrowding and child labour were also reported as concerns. A further violation of human rights took place in September 2008 in the northern department of Pando when elite-backed vigilantes killed a number of protesting peasants near the community of Porvenir. Other than this incident, international human rights organisations have not pointed to egregious violations of such rights, although the Morales administration has been criticised for acting in a high-handed manner in dealing with opposition-backed demonstrations. Bolivia has no death penalty for ordinary crimes, and has ratified the statutes of the International Criminal Court, ICC. These include the Asamblea Permanente de Derechos Humanos de Bolivia, based in La Paz, and Centro de Estudios Jurídicos e Investigación Social (CEJIS) based in the Santa Cruz region.